The capsule collection will debut with two signature denim silhouettes: a skinny jean that comes in three washes (Black Frost, Juliet Wash, and Hayes Wash) and another jean with a drop hem in Lorelei Wash, both ranging in sizes 23 through 32. 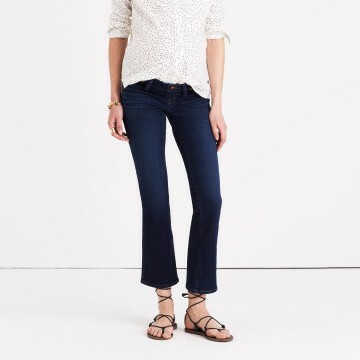 Each $138 style is cut low in front for extra comfort and high in the back for added coverage, plus these easy to pull-on jeans have elastic panels on each side with plenty of stretch for growing bellies. It’s claimed they won’t bag out or slip down as you go through your day—and that rear view? It’s so good that the expecting mamas around the Madewell office give ‘em a giant thumbs up—and pair them with the brand’s beloved sized-up tees and tops, naturally.